Do We Finish our Homeschool Curriculum? 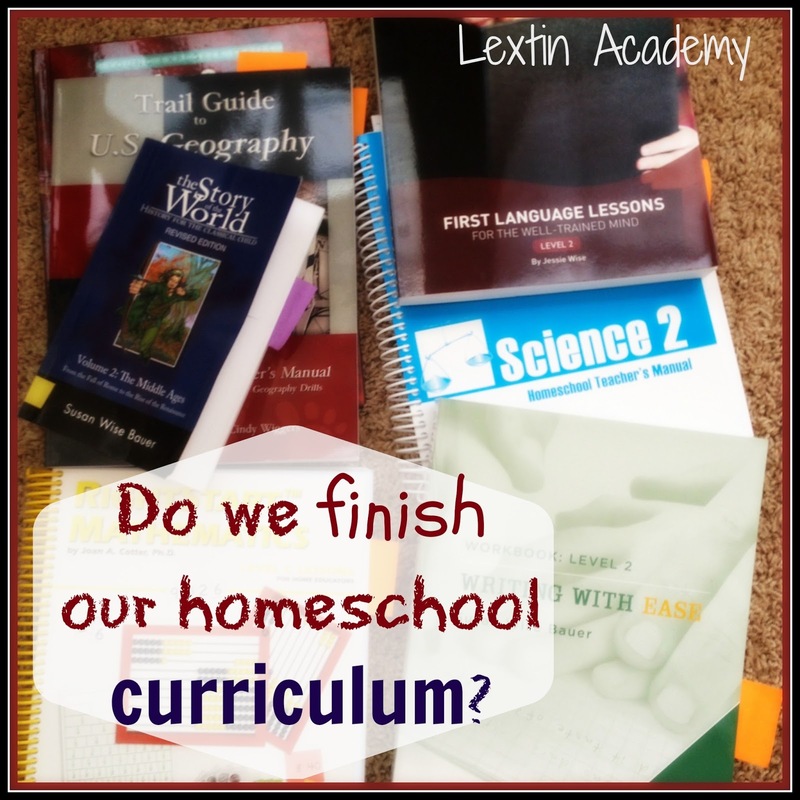 Do homeschoolers finish their curriculum? Some do, some don’t. Do public schools get to the end of their textbooks each year? Usually not. We finish. Yes, you read that right. We finish all of our curriculum. I’ve chosen curriculum that I think is worthy of completion. If a curriculum stops working for us or isn’t producing the desired results, we drop it and replace it with something that does. And then we finish that new product. We complete a curriculum even if it takes more than one year – the time frame isn’t important but mastering the information is. I’m not afraid to take breaks when we need them or even put a curriculum on the back burner if a child needs some time to mature, but when we’re ready we jump back in. One argument is that the public schools rarely finish an entire textbook in a school year. Well, Lextin Academy is not a public school and if I wanted my kids to have a public school education – they would be sitting in a classroom. Some argue that the first half of the next year is mostly review anyway so it doesn’t matter if you don’t finish. That’s not how our year works. We school with a year-round schedule and we don’t waste our time on review of topics that are mastered. The first part of each year is not full of review for us. We keep moving forward; I want my kids to be challenged. I put a lot of time into researching and choosing our curriculum and I’m just too Type A to quit in the middle of something. So, yes, we finish. It might take a few months or it might take a few years, but we finish the curriculum that is working for us. If it works, why would we be satisfied with stopping short?